Timely UK gig for Kleinveldt? Cape Town - The planets are aligning themselves rather nicely in early 2013 as far as Rory Kleinveldt’s Proteas career is concerned. The situation is in marked contrast to the beefy, now 29-year-old’s bumpier road last year, when he pleaded guilty to use of banned substance cannabis towards the end of the 2011/12 domestic season with the Cape Cobras and then, much later in the calendar year, had what many feared might be an ill-fated, lone Test appearance at short notice for South Africa against Australia in Brisbane. It was the series opener where the Proteas ground out an unconvincing draw; the Aussies dominated with the bat and went well past the 550-mark in their lone knock for the loss of only five wickets, and the debutant was thrashed for 97 runs without reward, including sending down an unacceptable 12 no-balls. But then Vernon Philander’s injury got him a reprieve for the second Test at Adelaide, where he upped his performance considerably. 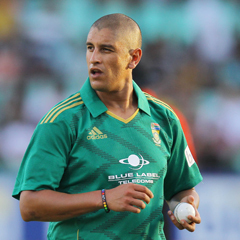 Kleinveldt has since played a forceful role in the Twenty20 series triumph over New Zealand, and was rewarded at the weekend with the news that he has made the first-time cut for the ODI squad for three matches against the Black Caps beginning at Paarl - a venue he obviously knows well - on January 19. Reading between the lines, it seems the Proteas hierarchy see him as a potential candidate for duty in the “death” overs, an area where they have sometimes struggled since people like Andrew Hall and Charl Langeveldt got too long in the tooth. Apart from his elevation to ODI involvement, the fast-medium bowler and sometimes big-hitting lower-order batsman remains hungrily on standby - as he was at Newlands - in case Philander’s ongoing hamstring difficulties keep him out of the second Test mix at St George’s Park from Friday. Should he be summoned, Kleinveldt would in all likelihood not let the cause down because he hits the deck hard and if the Port Elizabeth pitch continues its penchant for unevenness in bounce, could only enhance the Proteas’ assault-and-battery plans in the pace department against the fragile Kiwis. Another broad-shouldered South Africa competitor of a slightly earlier generation, Brian McMillan, was often a real handful at St George’s Park when conditions became more than a little “up and down”. But a further tonic seems imminent to a personal career that has, at different stages, looked dangerously like petering out innocuously in international terms - Kleinveldt is reportedly on the verge of agreeing terms for a 2013 early-season deal with English county outfit Northamptonshire. The Cricketer magazine’s website said on Monday that the county have spoken to SA’s national coach Gary Kirsten and it is understood there will be “no problem in obtaining a no-objection certificate” for Kleinveldt to represent them for a few weeks in the normally chilly beginning of the campaign from early April. He is believed to be deemed the suitable replacement for veteran Sri Lankan seamer Chaminda Vaas, who has been released. Kleinveldt playing (as provisionally planned) the first five County Championship games for Northants and three matches in the 40-overs competition, until around mid-May, would sharpen and acclimatise him perfectly for duty, should he be selected, for the UK-hosted swansong ICC Champions Trophy competition from early June. The Proteas open their account against India at Cardiff on June 6, so it is understandable that CSA bosses would hardly object to Kleinveldt playing in English conditions so shortly before it. He had fleeting exposure to county cricket in 2008, when he played one four-dayer for Hampshire against Lancashire.